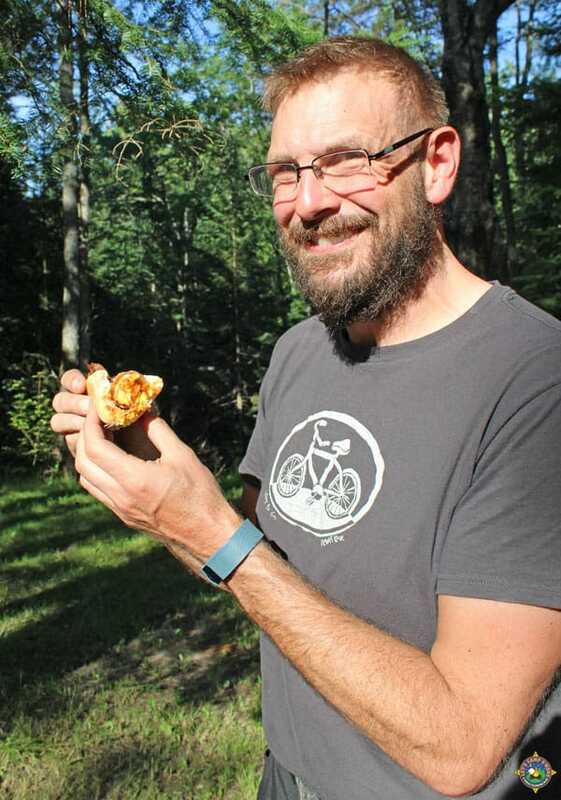 While we were on our Michigan summer trip, we discovered a fun way to cook hot dogs over the campfire. 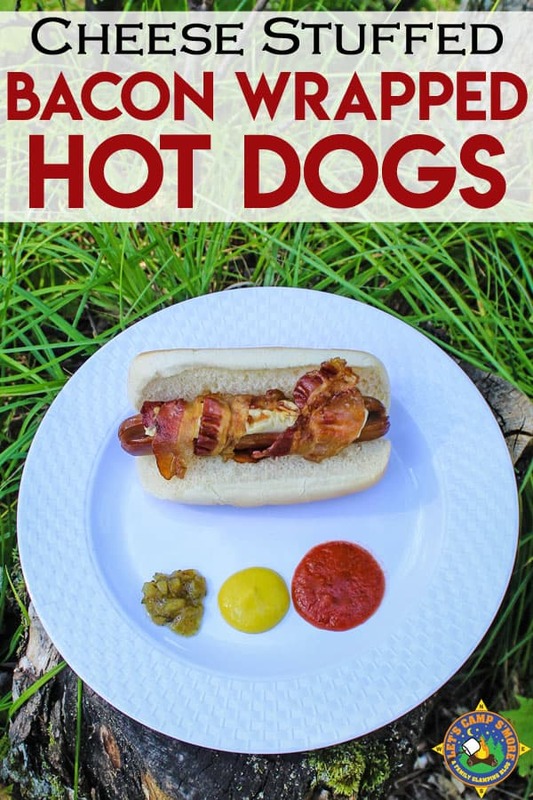 This recipe for Bacon Wrapped Hot Dogs is really easy to put together and will be enjoyed by the entire family. Diana is not a fan of hot dogs, but she loved these. The key to this recipe is precooked bacon. 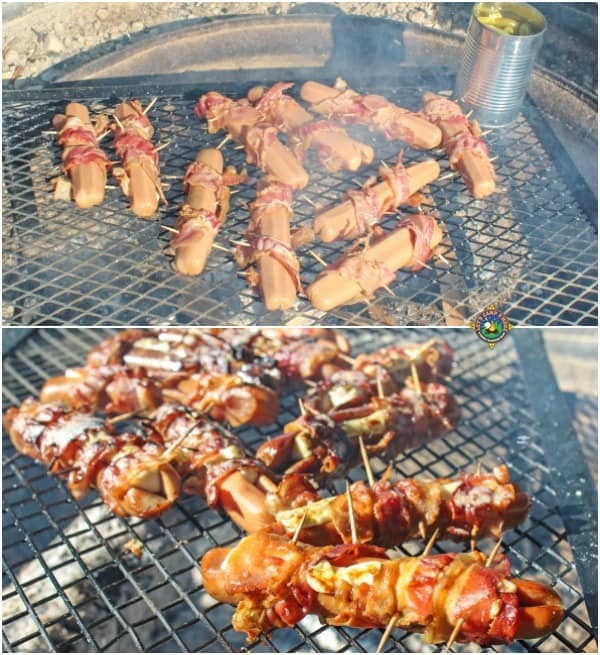 If you wrap raw bacon around a hot dog, the hot dog will be totally charred by the time the bacon cooks. Just try not to eat all the bacon as you prepare this recipe. You also need cheese sticks. We’ve tried a few varieties, but classic mozzarella cheese sticks work best. Prep for these hot dogs is straightforward, so the kids can help. You just need to remove the bacon and hot dogs from their packaging and unwrap the string cheese. Pull or cut the string cheese in half along its length. Make a long slit on one side of the hot dog. Place the half piece of string cheese inside the slit in the hot dog. 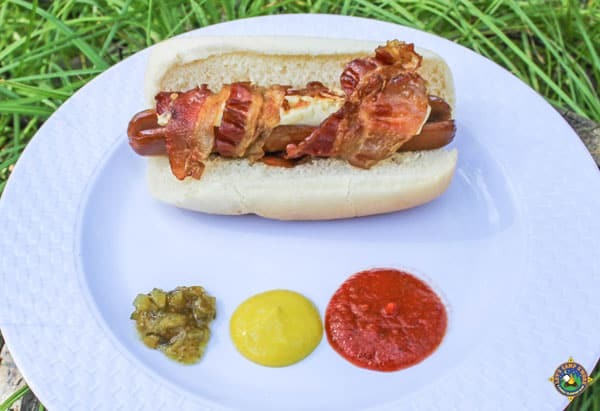 Wrap two pieces of bacon around the hot dog. You will need to use toothpicks to hold the bacon in place. We did not soak the toothpicks in water and they did just fine. None caught fire. Place the hot dogs with the cheese side down on the campfire grill. Flip the hot dog over when the cheesy side is starting to brown. We grilled ours for about 10 minutes total. Grilling time will vary depending on the heat from the campfire. So much so, that we ate them a few times on the trip. We served them on buns with a side of relish, mustard, and ketchup. Remove the bacon and hot dogs from their packaging and unwrap the string cheese. Pull or cut the string cheese in half along its length. Make a long slit on one side of each hot dog. Place the half piece of string cheese inside the slit in the hot dogs. 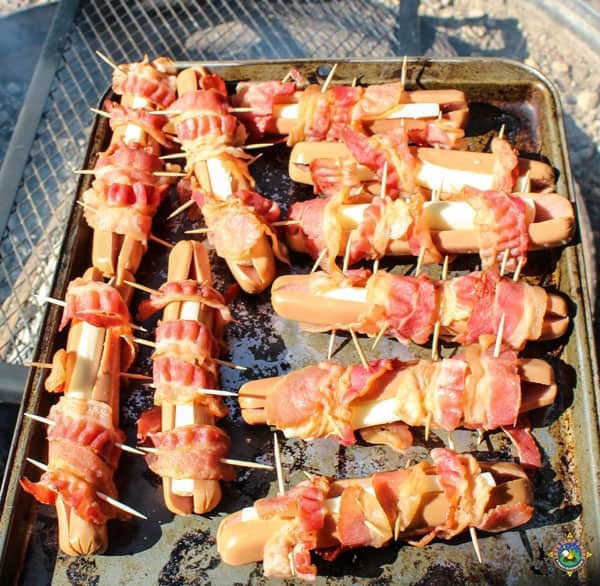 Wrap two pieces of bacon around each hot dog, securing in place with toothpicks. Place the hot dogs on the grill with the cheese side down. When they have crisped up the way you want, flip them over. When they are crispy, pull them off the grill. Place in a bun and top with your favorite condiments. This is an awesome idea. 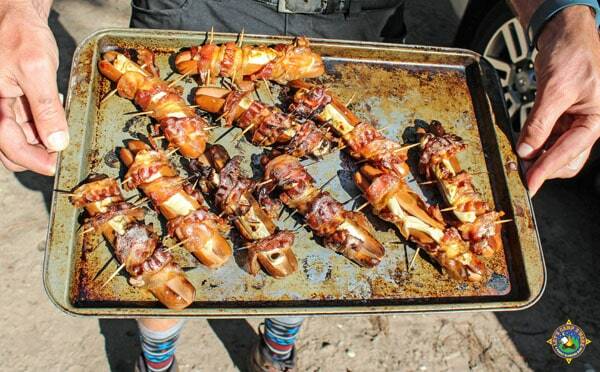 I’ve tried bacon wrapped hotdogs but never in a million years would have thought about adding string cheese! It’s yummy! Thanks for stopping by, Shane. Oooh… And they are stuffed too! My family would love these! Cheese sticks really make them fun! Bacon and cheese hot dog…yeck yea! Will be including this in a hot dog roundup.